A built-in nightlight doubles the amount of available illumination for this handsome bronze table lamp. This inventive table lamp is inspired by industrial, contemporary, and classic Arts and Craft designs. It comes in an oil-rubbed bronze finish over a metal frame, topped by an off-white oatmeal drum shade in a minimalist open cage. This stylish bronze table lamp takes a regular standard base light bulb underneath the shade, but it also has a prominent nightlight feature built into the body. A bulb in a vintage Edison style is included for use with the nightlight. Operate this lamp with the convenient four-way switch. Overall: 28" high. Shade is 15" wide x 10" high. Uses one maximum 150 watt standard-medium base bulb for the main light (not included). Includes one 60 watt type T bulb for use with the nightlight. Contemporary industrial table lamp with built-in nightlight feature from Franklin Iron Works. Oil rubbed bronze finish. Metal construction. Off-white oatmeal fabric drum shade. Style, design & matches our current fixtures. It will work well with our barely “off white” leather sofa on our end tables. Looking forward to seeing them! Love the nightlight idea and the slim nature of the base. The shade just looks like fun! Perfect for my husband's side table! I love everything about this lamp, especially the option of having a vintage style night light in the center of the lamp base. Love the look, the lines of lamp & base & the extra long bulb within the base. BEST ANSWER: The lamp weighs approximately 6 pounds. what color is the lamp and shade? 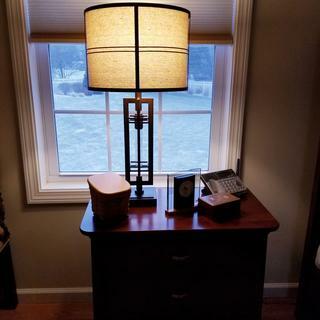 BEST ANSWER: the Lamp is a antique brown and the shade is tan housed in the same antique brown metal housing. What is the measurement of the base? BEST ANSWER: I don't know, and I gave 2 as a gift, so I'm not at liberty to measure it, but the lamp base is sturdy and is such a nice lamp. Would this be appropriate for a nightstand? BEST ANSWER: As long as your nightstand provides at least 3 to 4 on each side of the lamp, I believe it would look nice. They are placed on two end tables on each side of a sofa, and look really nice and very proportional. Yes, I have it on a bedside night stand. Looks great. Love it there. That's what I have my lamp placed upon. Is this a cordless lamp? BEST ANSWER: Nope, this lamp has a power cord. If you use wireless bulbs line Phillips Hue it can be controlled wirelessly. No this a a cord lamp, I love my lamps ,I put the night lights on in the evening when watching tv. No. I has a traditional electric cord...but it does have a longer cord than average older lamps! No, it is not. I have 2 on end tables and really like them. No. The cord is located on the bottom base of the lamp. No, it is not cordless. But it is beautiful. No. It plugs into an outlet. Where can you buy the bulb for night light? I just searched and came up empty. BEST ANSWER: I have added a replacement bulb below. Love the look and style of this lamp. 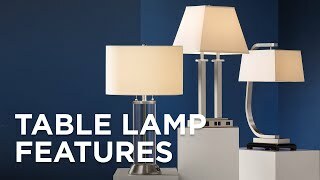 I would need to know if this lamp is compatible with setting up a command from the Amazon Alexa? BEST ANSWER: Hi Stephanie - No, this lamp was not designed to work with the Amazon Alexa. You may want to check with Amazon directly on the Alexa's specifications. Sure, I do not see why not. Just check with the smart plugs manufacture or specifications. BEST ANSWER: Hi, the 4 position switch works as follows: First turn, top light comes on. Second turn, top light turns off and night light comes on. Third turn, both top and night light come on. Fourth turn, turns both off. When you turn the lamp on, both the top bulb & tube bulb light up. Switch again for just the top bulb, again for just the bottom (night light) and again to turn off. I hope this is what you meant. How do u turn the lights off/on? BEST ANSWER: Hi - the switch is located on top light bulb socket and is a 4-way switch. Turn it once (only bottom light on), turn it twice (only top light on), turn it third time (both lights on), turn it fourth time (all lights off). Many thanks for ur quick reply. I was hopeful that the switches were not in the floor. This helps in my decision making! Thanks for ur quick response! I was hopeful it was where u shared as I do not want to purchase one where the switch is on the floor. Is there a coordinating floor lamp that you would suggest? BEST ANSWER: There is no identical match for this floor lamp. 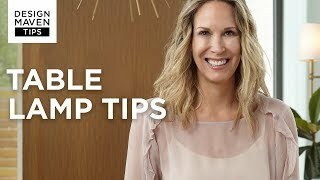 There are several that could coordinate nicely depending on the décor in the room. 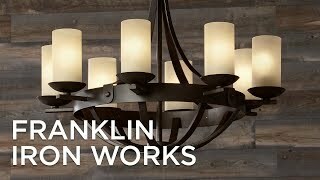 Click on the link below to browse the whole Franklin Iron Works selection of floor lamps. I have also attached a few that I believe could work nicely in the same room as this gorgeous table lamp. This is a gorgeous lamp. More attractive than pictured. 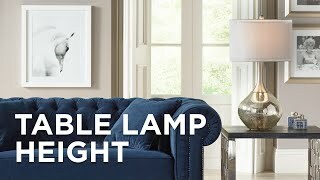 We took a chance on a new lamp source. Have used Wayfair or regular lighting (brick/mortar)shops in the past; but both have had their issues. 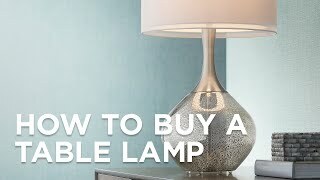 This online LAMP store is amazing!! The lamps did arrive in two separate shipping cartons on different days (consecutive days tho) but they were packed safely, shipped quickly and BETTER than we imagined. They are so much more elegant in person. They go with our already established 'Mission/arts&crafts' style of lighting and look amazing on the nightstands. They make a statement without looking ostentatious or out of place! Thank you for a quality product and super fast shipping! Beautiful lamp. I love using the soft night light for ambiance. Love our new Elias Metal Night Light Table Lamp! This night light table lamp is very unique, which makes it a great item to purchase. The quality is excellent, and already I've had people ask me where I got such a unique lamp. I love the fact I can put on the lower light for a softer light in the room or the brighter light to read by. I am extremely pleased with this lamp, especially the ambiance of just the bottom light when you don't need anything brighter. They are even better in person ! Love them ! !